May’s birthstone is the emerald, a gem revered throughout history, from the famous jewels of Cleopatra to the fictional Emerald City in The Wizard of Oz to your local Austin jewelry store. Emeralds are the rarest of precious gems, and in fact, they are among the rarest of all gemstones. Emeralds range in color from light to very dark, deep green. They are made of the mineral beryl, like March’s birthstone aquamarine, and their green color occurs when more chromium and less aluminum than normal are present in the beryl’s crystal structure. Unsurprisingly, then, the most valuable emeralds display a bluish hue along with the green. The quality of emeralds, like that of diamonds, is measured with the “four Cs”: carat, cut, color, and clarity. 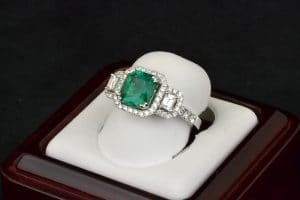 However, when it comes to emeralds, most gemologists and jewelers place much greater emphasis on color than the other three factors, and the cut of an emerald can greatly enhance its color. Emeralds are so often cut into a particular elongated octagonal shape that that sort of cut has become known as an “emerald cut,” even when it’s used on other gems. Emeralds’ green color has long made them a symbol of springtime, fertility, and rebirth, and for Christians, they represent the resurrection of Jesus Christ, while the ancient Romans tied them to the goddess Venus. Emeralds have been thought to cure bleeding, dysentery, and fever; to prevent epilepsy; to soothe the eyes; and to calm panic. During the Middle Ages, these gems were said to hold the power to predict the future. Emeralds are known to have been mined as long ago as 1300 B.C. in Egypt. When Spanish conquistadors arrived in the Andes region of modern-day South America, they saw the local indigenous rulers wearing emeralds and commandeered many of the stones as they invaded, but it took nearly twenty years for the Europeans to discover the locations of emerald mines in the area. More recently, actor Elizabeth Taylor was known for wearing emeralds; a famous emerald pendant that once belonged to her sold for $6.5 million in 2011. A popular choice for Austin custom jewelry, emeralds can vary widely in price, depending on the size and quality of each stone. Many of these green gemstones contain small inclusions (imperfections) that can be seen with the naked eye, but this is something of a given with beryl stones and will not detract much from the overall value. Emeralds that are smaller and/or lighter will probably be lower in price, as will gems that have been created in a lab rather than mined from the earth. Whatever your preference, your knowledgeable team at Copeland Jewelers can help you choose the perfect piece of ready-made emerald jewelry or design the custom emerald piece of your dreams!